SEO trumps social on driving traffic? Not so fast. A post today in Crain’s comes from an SEOer who claims that SEO is what drives traffic above all else, not social media. I certainly don’t disagree with him on the power of search engine optimization to be a big traffic driver, but I’ve got at least one case study that says social media can be a primary traffic driver, even over SEO: My own. First and foremost, let me add one gigantic disclaimer: Everybody’s website and blog is different, with different audiences that behave in various ways. Some people are more searchers and have a great idea of what they’re looking for. Some don’t and stumble upon something they like, then share it with others. For me, Facebook is by far the best referrer of traffic to this blog. It’s not even close. It’s like Mark Zuckerberg called up a bunch of fans of mine, put them in a semi-trailer and drove them to my site. Then he turned around and did it again the next day. Facebook isn’t just tops in referring people to my site but in share-ability of posts. Again, this is where you need to pay attention to where your audience “hangs out” online. While it seems obvious, I really have to wonder if people factor this into their equation. It’s why I cringe whenever someone says, “You need to be on _____(insert site here)” without ever sitting down with the customer and getting a feel for who their primary target is. Not just demographic stuff but real behavioral targeting. Would you give a potential bride any old wedding dress off the rack without talking to her, getting to know what she likes, understanding what her budget is and taking her measurements before you know what you can recommend? Since many in my audience are businesspeople, it’s no surprise that LinkedIn is a popular place for referring traffic and sharing posts. It’s right around here that my search engine optimization traffic comes in as a #3 referrer for various terms used. It’s very close with LinkedIn, but L.I. does edge out my traffic from Google slightly. Even so, Facebook crushes it – almost triple the amount of referring for all search engine terms. Again, before you run into your boss’ office saying, “we need to be on Facebook and LinkedIn” remember that this is the way MY audience is behaving. Yours may be completely different and very search engine oriented. Behind these three but still very valuable to me in terms of traffic are e-mail and inbound links. You know e-mail, that supposedly ancient method that continues to keep on giving. When a company has interest in a post and wants to share it, they may or may not be a company where social media is widely used. So the next best path is, naturally, e-mail. I’ve had many posts shared this way with traffic coming back to the blog. After Facebook, e-mail is the second highest way my posts are shared among others. Inbound links have been kind to me as well. I’m referring to sites that picked up my posts and linked back to my site in their own posts. If those sites have high traffic themselves, I get high traffic. This is practically tied with e-mail for refer-ability. Of course, as the tools of social media are always evolving, I’ll be interested to see how Google Plus plays into the mix as I revisit this list over the next month and quarter. I only expect it to gain more traction over time. The point of sharing all this is simply that in the case I’ve just outlined to you, both social and SEO are working together to play a fundamental role in increasing traffic and sharing for me. The audience data tells me so. To suggest one or the other is always the go-to method for people is a blanket statement that doesn’t often apply. For some, SEO may be #1 and for others, social may be #1. But rare is the case where both shouldn’t be high on your list. They certainly are on mine. We in the advertising and marketing business like to reminisce about our own industry as much as anyone. We like to look back on the work of Bernbach, Burnett and Ogilvy in reverence. We talk about the “Think Small” ad, the “We Try Harder” ads for Avis, the Levy’s Jewish Rye ad and the man in the Hathaway shirt. I love those classics too. But we can’t resurrect efforts that need to lie in the grave where they belong. For example, Michigan-based Domino’s is bringing back The Noid for a week. I know it’s only for a week, but why? Some people have had a passing fascination with one of the world’s weirdest mascots ever, I’ll grant that, but I’m enjoying what Domino’s is doing with their “Oh Yes We Did” effort. They’re taking on their harshest critics, admitting where they screwed up and having people vote on the product (“Rate Tate’s Chicken”) like never before. They’re even putting reviews up in Times Square. Putting opinions of the food one way or another aside, I believe Domino’s is working harder to improve themselves and appreciate putting themselves out there in the truly interactive environment we’re living in. It’s rare, refreshing and gutsy. More companies should be doing it. Don’t confuse this with mascots that have stuck around for years. I’m not suggesting that Planter’s should suddenly off Mr. Peanut or Frosted Flakes should fire Tony The Tiger. I’m suggesting that if a long dormant mascot/brand effort went away, maybe there was a good reason for it and we don’t have to bring it back. Maybe we can challenge ourselves to come up with a better idea that applies to the current generation instead of becoming Hollywood and remaking classic movies because we know they were great back in the day. Advertising has been called a young person’s business. But you know what makes a young person old? It’s not age. It’s mentality. A veteran ages by the word every time they say things like, “Gosh Ed, do you remember 20 years ago when we worked on the ____ campaign? Those were the days. Somebody needs to do something like that now. Kids today don’t do enough of that kind of work.” OK. So you do that kind of work. Why not? Because agency politics prevent it? Because the client won’t let you? Please. If you’re going to get fired up and passionate about the work that was done in the 80’s, show at least the same passion if not more for the cool technology and applications that we’re just beginning to see. Begin to understand it and embrace it. Get revved up about QR codes and projections on buildings and Google Plus – not because you’ll necessarily DO that for a brand or yourself but because it represents evolution. And evolution can be as exciting as what’s been done if not more so. In other words, for every time you re-read “Ogilvy on Advertising” (as I am), make sure you’re absorbing a boatload of books, magazines and blogs speaking to the changes in the way we’re communicating and what lies ahead. Until we find the real thing, that’s as good a Fountain of Youth I know. 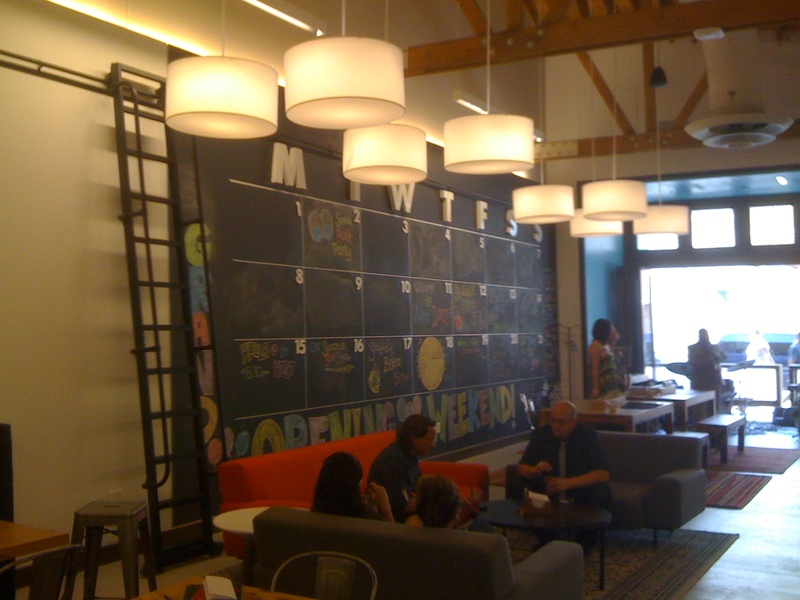 First look inside State Farm Next Door : An environment in an innovative State. As I started to make my way up Diversey Avenue, I heard the clamor of a jazz band playing near Trader Joe’s grocery store. That couldn’t be coming from State Farm, could it? Surprisingly, it was. And already in that moment, I think that maybe, just maybe, I experienced a small piece of what State Farm is striving to do with its new community-based effort, State Farm Next Door. The "teaser" wall is down. We're going in. State Farm was nice enough to invite me to a pre-launch party for select guests to come experience Next Door for themselves. I’m happy to say it did not disappoint. It honestly exceeded what I thought I would see. Along the way, I got to sit down with the managers, planners and vendors who showed me what people could expect from Next Door when it officially opens on Thursday, August 11th. Is it OK if we have fun in here? Cool. If this was some thinly-veiled approach to selling services, I seriously didn’t feel it. Really. The subtle references to finances and planning are there, but you get the sense that State Farm has been extra careful not to come across as heavy-handed in selling. If it was too pushy, it just would not work. Period. And thankfully, they know it. Like a Good Neighbor, State Farm is There. With a cool lounge area. Wander over to the cafe for a gourmet espresso. And of course, those Pods. A lot of these design elements are, dare I say, fun and creative. Still, you might be wondering, “OK. But let’s get real. What if I want to get into some sensitive financial stuff? I can’t just discuss this out in the open in a cafe.” State Farm considered that. 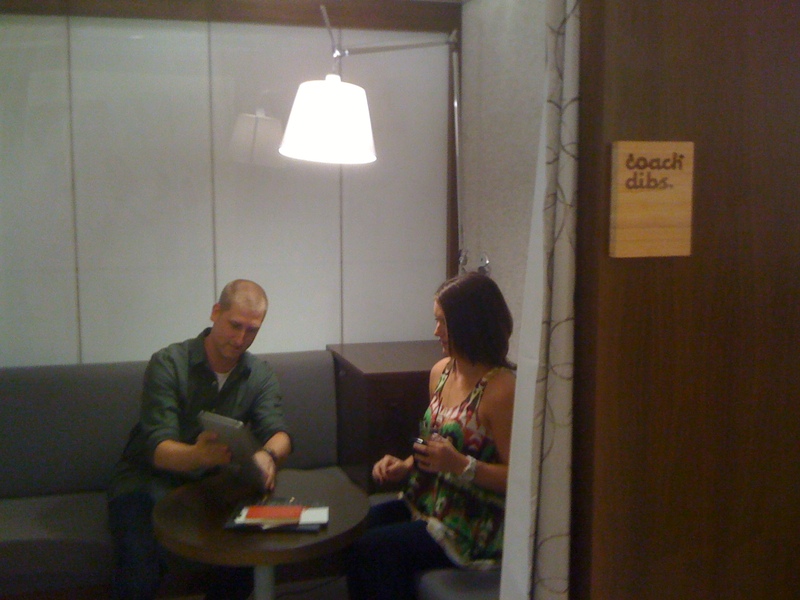 A financial planner named Adam showed me one of the “Pods” that a planner can take a guest or two into to get more privacy for financial-related chatter. This is probably my favorite feature of the place – these things look right out of the IKEA catalog and are just as functional. You can roll them to different parts of the store if need be. When you want to chat about finances, step into a Pod with a planner. 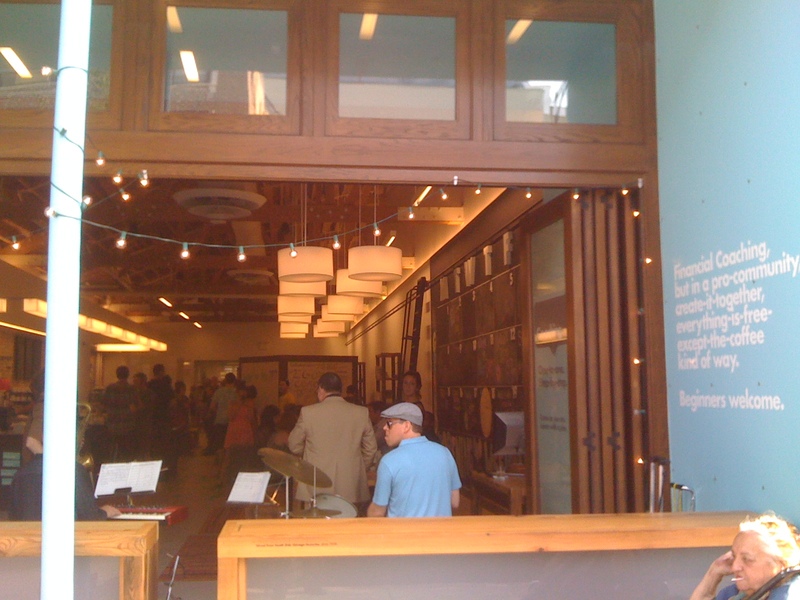 We’re entering a new phase beyond just the “pop-up store” where people can try products for a few days before a temporary store is disassembled. It’s a phase of Store As Audience Research Tool. Maybe you think you’ve seen this before but trust me, you probably haven’t. Very few stores if any have been set up almost exclusively for the purpose of learning and understanding the behaviors of its audience in the way Next Door has. I’ve heard a lot of questions about ROI and metrics of success for Next Door. So let me just say this – there’s absolutely nothing more important in branding than knowing what your audience is thinking. It’s elusive. It’s shifting. It’s hard to interpret. If it was easy, everyone could do it and I’d have to find another way to make a living. So when you effectively set the stage for that audience to come to you and tell you their thoughts and feelings, you’ve got an invaluable environment worth keeping. Some of us have run focus groups where we’d have to practically bribe people to show up, right? Well, how about someone who voluntarily comes into your environment, has a few questions, winds up signing up for a seminar given by one of your people and returns with 5 of their friends to learn more? For Brett Myers, a key head at State Farm behind Next Door, this represents months and months of intensive, detailed planning. It’s not a stretch to say every single table lamp, book, piece of glassware and paint color has been obsessively considered prior to entering this space – by the way, do you think about your own environment in reflection of your brand with this kind of detail? Maybe you should. Strange as it may seem to some marketers in such a research-driven world, it’s not about number of meetings taken in the Pods. It’s not about guests converted into customers. Or number of cups of coffee sold. It’s about getting consumer feedback and lots of it. It’s about understanding the real fears and questions that a young target has. And it’s about taking all that feedback and reporting it back to State Farm corporate so they can use it for all kinds of initiatives – undoubtedly to ensure that the brand is speaking in a voice these consumers want to hear. 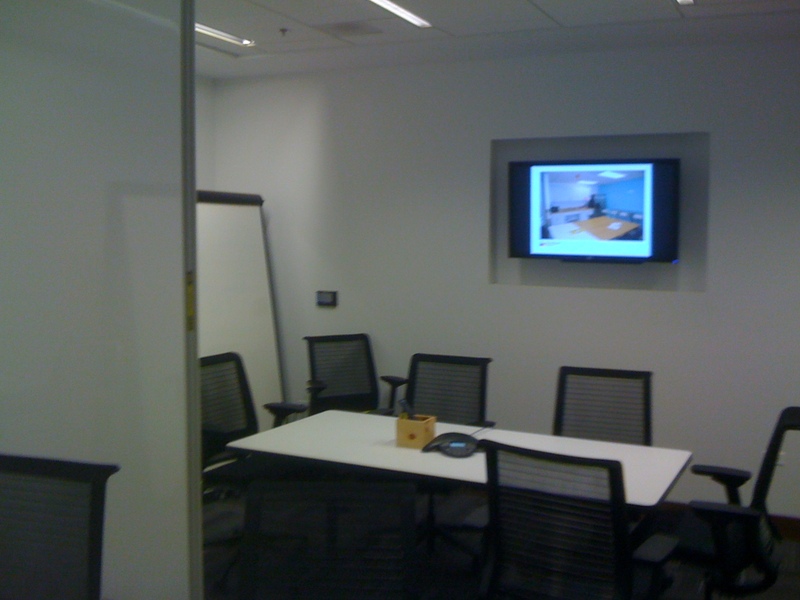 Anybody can rent one of these conference rooms for free. Really. 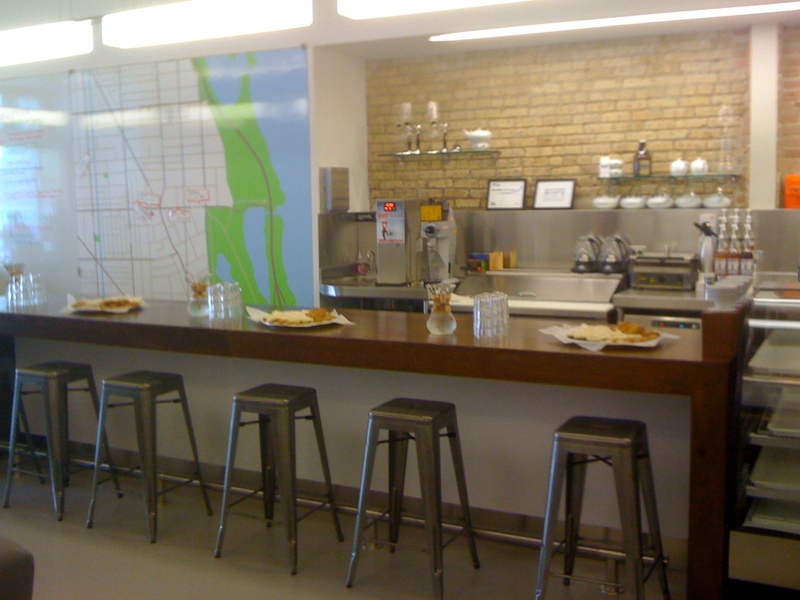 To get the cafe portion of Next Door off the ground and give it a feel authentic to the neighborhood, State Farm partnered with Doejo, a digital agency whose founder is behind several independent Lincoln Park/Lakeview coffee shops, including Kickstand and Noble Tree. As Darren Marshall of Doejo explains, Next Door will revolve and evolve around those who enter. While Doejo will concentrate primarily on the cafe portion of Next Door, their team may very well collaborate with State Farm when necessary on ideas involving the overall environment. Special thanks to Desiree Fuzak, Stephanie Reynolds, Brett Myers, Darren Marshall and many others on the State Farm Next Door/Doejo team who helped provide me with their insightful thoughts for this post. There used to be a time when country clubs and golf clubs could mention who their course was designed by, show some great aerial photos of the course and rely on that to do much of the heavy lifting for drawing interest. Those days are gone and I don’t think they’re going to return. Clubs of all varieties find themselves trying to plant their stake in the ground when it comes to positioning themselves and standing out. Why? People aren’t walking away from playing the game in the midst of economic turmoil (walking away temporarily due to their scores, perhaps), but these people certainly are being given options to explore. And it’s forcing clubs to get creative. Yet, some of the “creativity” I’ve seen from club managers consists of price-driven daily specials to get golfers in the door that may give a short jolt at best for a slow day but rarely results in any long-term loyalty. When a golf club or country club can build an effort that’s true to who it is as a brand based on its heritage or profile of members, I think it’s got a genuine story to share that’s worth telling. When it’s not genuine (i.e. a country club that pretends to be kid-friendly toward potential new members despite the fact there aren’t any facilities or programs to cater to children), people find out not long after the membership Open House, if not right then and there. So it was refreshing to witness a tournament that plays so well into the fabric of what a club is all about. Downers Grove Golf Club is the oldest golf course in America west of the Allegheny mountains, established in 1892. Sure, this is a nice factoid that’s good for bragging rights vs. your typical course, but rather than resting on its laurels, Downers Grove let its past come to life at the All American Hickory Open this weekend. If you think this is your ordinary corporate golf tournament, think again. Put away your tees, sir. 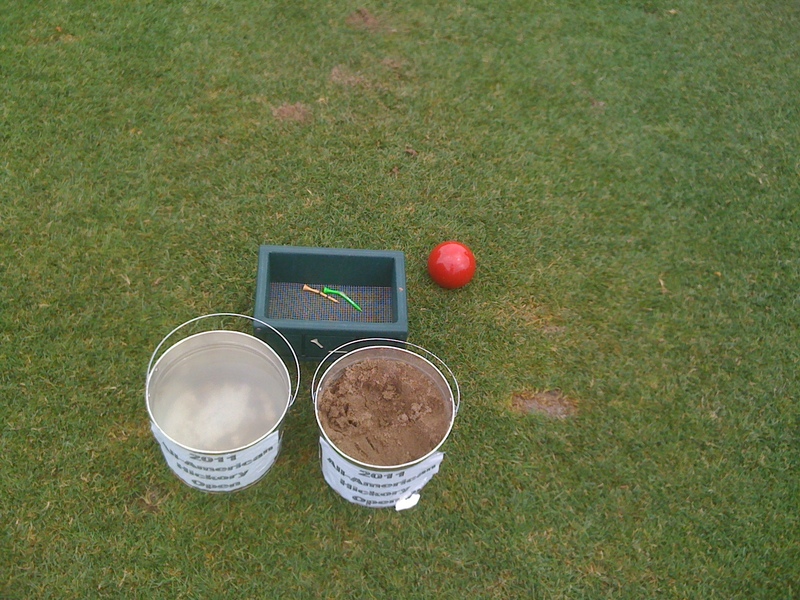 You'll be making your tee old-school today from a pile of sand. The beauty and originality of the Hickory Open is that it is played with pre-1900 golf equipment, including golf clubs and golf balls. As a bonus, I was pleased to see nearly all the players in the tournament getting into the act by dressing the part of a turn-of-the-century golfer too. Knickers and ties for men, ladies with parasols. From a real brand perspective, the result I see here when you have an event like this is that it’s not only a nice piece of revenue for the golf course but hopefully an annual event that gets continued and growing coverage – not as a gimmick but as an authentic tie to the club’s roots. It’s about playing with the instruments of the past on a course that’s as steeped in history as any. Close your eyes and you’d think you’re in 1890. Considering how many of us see the golf course as an escape, think about the number of gents I saw taking pictures of one another as they whacked at a ball not off of a tee, but off a mound made of sand – just like the way they used to do it back then. They had an experience that was unique, memorable and just as important – tied back to the club. A brand can get a lot of mileage out of a memory like that. On the left, a ball from the old days. 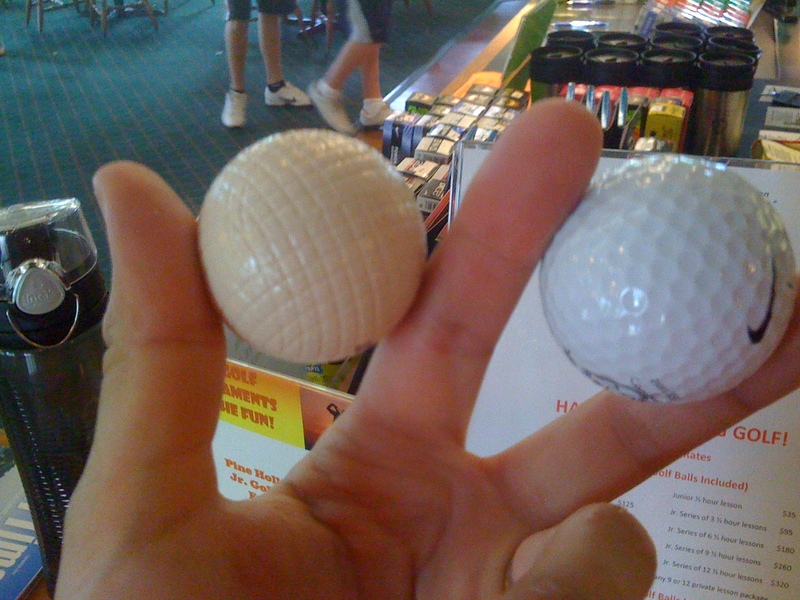 On the right, a modern day ball. Different size, different texture. They hit the one on the left a lot better than you'd expect. In case you’re wondering, even though there’s definitely a difference from yesterday’s clubs and balls to what we use today, most of the shots I saw with the old sticks were pretty darn good. If you’re a GM, Membership Director or Board Member of a golf or country club, what are some of the creative ways you’re attracting interest with your authentic brand’s story? If you’re stumped and need a framework on where to begin, here’s a good starting place. 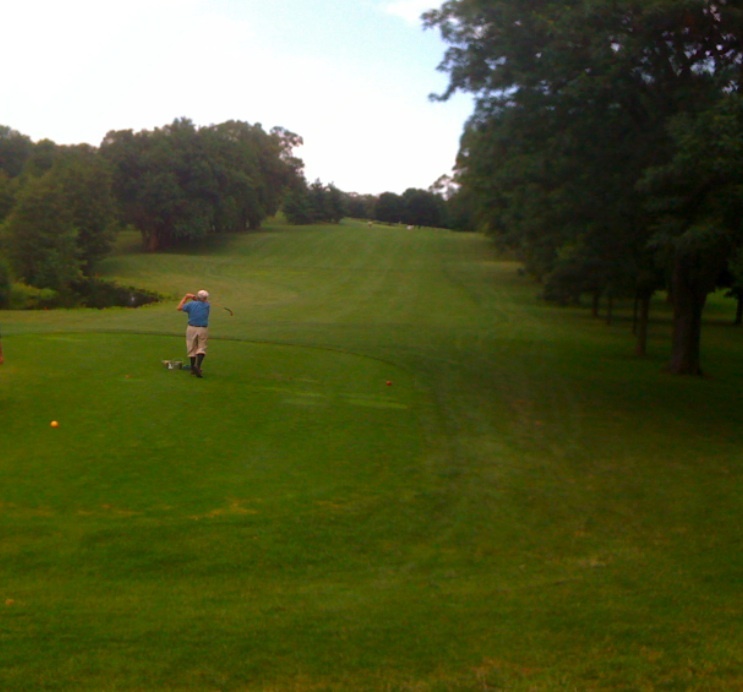 Downers Grove Golf Club is located at 2420 Haddow Ave. in Downers Grove. Call 630.963.1306 for more information. Simplifying your brain even with an additional 37 Signals. A thought today that inspires me from Chicago-based 37 Signals. Rather than add on, think about what you can strip away and simplify to make the experience of working with you more enjoyable for your audience. Innovation via undoing complexities your customers face. What a refreshing concept in this perpetual “add on” world of ours. When people have come to me over the last several years with an idea that will launch a new product or service, their minds often start to race with product line extensions, offshoots and even selling the company. All before anyone on Earth knows about them. He’s right. Just to be on the safe side, they supply 1-2 minute bite-sized videos of each feature of his products, but you never need to watch it more than one time. His project management tools like Basecamp, Highrise and Backpack are that intuitive and easy to grasp. Basecamp essentially allows your team to collaborate and communicate with clients in a way that’s both advanced and very simple (posting thoughts in streams of communication not unlike what you see on Facebook but easier than e-mail). Let’s look at another company – Yammer takes the concept of e-mail communication and speeds it up internally for greater group communication and input. Sending e-mail back and forth: Clunky. Yammer: Crazy simple. Think about this notion for a moment as it applies to you. Is your product something that is so simple that nobody would have to sit down with one of your people to understand how it works? That they could just watch a 2-minute video? If not, where do the complications occur? If you offer a service in the B2B realm that requires a face-to-face, can you structure yourself in such a way that people get exactly the advantage of working with you (“Just go to our website and you’ll see what we do.”)? This is not an easy challenge as we all have varying things of complexity we sell to the world, whether it be bobbleheads or I.T. solutions. Yet, I believe we hurt our own cause when we try think about one-upping competitors by adding on rather than taking away. It goes back to focusing on what you are absolutely best at, not what you are mildly good at. Perhaps, but you’re not making it easy on someone to say you can do it all. Really. A more likely and natural scenario is that they’re looking for one service at this moment. Then, in time, you may be able to expand the relationship into other areas as they become more trusting. In other words, are there areas of your communication that could be simplified to focus more on ONE area of service that you are particularly known for or a partner has gained a reputation for that you can play up more than ALL of your parts? Similarly, if you’re a Realtor, why say you’re the Realtor who has been around for 25 years? No offense, but that’s what a lot of people say. How do you make the process easier on first-time homebuyers in the western suburbs of Chicago? What I’m getting at is a combination of de-cluttering your brand and clarifying your focus from an operations/technological/process/people perspective. Be honest with yourself. Who represents the audience you have related best to? If they’re not profitable enough, you can add on another audience to go after, but just remember how that will affect the communication strategy you need to present. I’m a bigger fan of “Here’s how we understand your audience” messaging that’s tailored to a specific group vs. “Here’s what we do at our firm” messaging that aims to appeal to all. It’s not merely about some fancy name and putting a “tm” next to it. Is your process marketable by its simplification or does it follow the same path that any other competitor would expect to follow? From a customer service standpoint, if other companies have a maze of an automated phone system, do you have texting, Skype and other methods that streamline the way to get a hold of you faster? Can you use a product like Square to let them pay for services then and there? By the way, this has applications to internal processes too. I once worked at an agency that had 8 pages on workflow process, complete with flowcharts for all scenarios. Impractical? You could say that. Talk about a glaring need to do away with extras for the benefit of the end user: the client. What can you “undo” in complexity that is atypical of your industry? This doesn’t even have to mean entirely new products or services – you can start with aspects of your business. For example, if the client expects a mountain of paperwork in order to engage you, what can you do to go paperless or provide just one invoice (there’s a nice environmental angle in this as well)? Listing all your services is fine, but how do you make it easier on someone to find a wealth of information on exactly the service they know they need? And please, give them more than “We have X employees in the ____ division” when they get there. You’re not making it more complex by adding content here – you’re making it easier for them to make a decision because they’re finding more about you than the other firm and it’s raising your credibility in their eyes. Think about the mechanism you can implement that make it easy as pie for a client to understand what they need to do in order to get rewarded from you. Maybe it’s nothing more than giving you their business – so what reward do they get? Maybe it’s a certain number of times visiting your restaurant and checking in on Foursquare. Maybe it’s an Amazon gift card for every qualified referral they make. If they sign up to try your software and forward a link to 5 friends who also sign up, does that original person get an upgrade? In any event, the complexity here isn’t that there’s too many rewards…it’s that there’s usually none. You can take advantage of this empty space others don’t always inhabit by communicating what clients will clearly get for a desired response. Innovation through simplification. I’d love to hear examples of it you’ve come across, whether in your own company or other brands you’ve encountered.